We’d love your help. 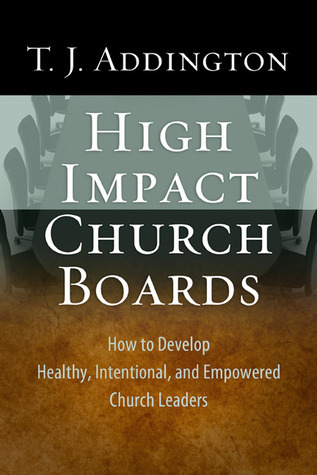 Let us know what’s wrong with this preview of High-Impact Church Boards by T.J. Addington. High-Impact Church Boards can help your board revolutionize its leadership and management—and discover how to make church leadership easier and more fulfilling. Learn how to develop healthy elders, deacons, pastors, and board members who practice intentional leadership within empowering governance structures. This book will help your local church chart a path toward healthi High-Impact Church Boards can help your board revolutionize its leadership and management—and discover how to make church leadership easier and more fulfilling. To ask other readers questions about High-Impact Church Boards, please sign up. This book was given to me by our church board who are reading through it together. They wanted all the staff to read a few chapters to have a sense of what the board was working through. I ended up reading the whole book and love the principles that the author gives for Church Boards navigating change in their church. I definitely see where the effectiveness of this type of book would increase when a board reads through and discusses it together. There are many exercises, and transformational que This book was given to me by our church board who are reading through it together. They wanted all the staff to read a few chapters to have a sense of what the board was working through. I ended up reading the whole book and love the principles that the author gives for Church Boards navigating change in their church. "Frustration is the Chicago tollway at rush hour roughly defined as most of the day! Whoever designed this highway toll system that forces all cars to stop or slow down at a tollbooth every five miles is responsible for millions of wasted hours and unbelievable inefficiency. Not to mention lots of frustrated drivers. Every time I drive through I ask myself why one of the most sophisticated nations in the world cannot figure out how to manage its roads more effectively. There has got to be a better way I muttered. That is the echo of thousands of Church leaders who live with the frustrations of numerous "tollbooths" in their congregational systems. In Churches a tollbooth is everyplace where someone must get permission, funding, or agreement to move ministry forward. Many congregations live with cultures every bit as frustrating and ineffecient as the Chicago tollway. These systems come with a high cost: waisted time; lost ministry opportunities; and frustrated leaders, staff teams, and volunteers muttering, "There's got to be a better way". Our Churches must become cultures of Empowerment if we are to be the people God has called us to be. The third section of this book is all about developing cultures of empowerment in your congregation. It is about moving from a permission -withholding culture ("You cannot act without permission") to a permission granting culture ("You are welcomed to act within your sphere of responsibility without asking permission"). It is about unleashing and releasing leaders to lead, staff teams to act, and congregations to minister so the Church is everything God made it to be. It is killing bureaucracy wherever we can and creating cultures of great ministry opportunity. When we study Jesus' life and ministry, we see neither control, bureaucracy, nor mistrust. Instead, His ministry reveals an amazing bias toward empowering and releasing others. After giving instructions, Jesus sent out His disciples to minister without Him. Beyond the twelve disciples He sent out other groups to act on His behalf, such as the seventy two (Luke 10: 1-24 ). Never do we see Jesus trying to control people in ministry. That does not mean He had no parameters: jesus gave specific instructions and then debriefed and taught afterward. Jesus took the biggest gamble of all time: He entrusted His Church to His disciples. Think of that. He took His most precious possessions and entrusted it to the like sod Mark and Peter and John and Matthew and you and me. He basically said, "Run with it, according to my instructions and in the Power of My Spirit. Rather that keeping ministry to Himself, He gave it away… and trusted us. Ephesians 4:11-12 And He Himself gave some to be apostles, prophets, some evangelists, and some pastors and teachers, for the equipping of the saints for the work of ministry, for the edifying of the body of Christ. Christ gave these individuals His ministry of leading and equipping the Church. "Healthy congregations intentionally develop cultures of trust and practice giving it ministry away. Healthy congregations trust and empower leaders, who trust and empower staff members, who trust and empower the congregation to do the work of ministry in all of its facets"
Ephesians 4:14-16 that we should no longer be children, tossed to and fro and carried about with every wind of doctrine, by the trickery of men, in the cunning craftiness of deceitful plotting, 15 but, speaking the truth in love, may grow up in all things into Him who is the head—Christ— 16 from whom the whole body, joined and knit together by what every joint supplies, according to the effective working by which every part does its share, causes growth of the body for the edifying of itself in love. What happens? Our congregations become mature; our people are productive for the Kingdom; and love prevails. Mistrust and control breed conflict, bickering, and smallness of ministry. Trust and empowerment get people into the game of meaningful ministry. They bring energy, unity, enthusiasm for what God is doing, and kingdom fruit. Which would you rather have? The Tollway in Chicago is not quite as painful for those who purchase electronic passes. They can cruise through without stopping. The goal of building cultures of empowerment is to allow ministry in the local church to move quickly and effectively, within agreed upon parameters and with as few tollbooths as possible to move from tollbooth to passes for the sake of the mission Jesus left His church. By gifting every believer with significant gifts to be used for His kingdom, Christ designed the Church to be the most empowered institution on the face of the earth". Pastors who have read this book seem to gush enthusiasm for it. I wish I shared their sentiment. The book reads like a textbook to me. Don't get me wrong; the information is good and worth the time. I just don't connect with it like they do. This was my second time reading through this book. The first was with an earlier edition, and that experience is probably still coloring my opinion of the book. The information was good, but I thought it poorly organized and in desperate need of an editor. I Pastors who have read this book seem to gush enthusiasm for it. I wish I shared their sentiment. The book reads like a textbook to me. Don't get me wrong; the information is good and worth the time. I just don't connect with it like they do. This was my second time reading through this book. The first was with an earlier edition, and that experience is probably still coloring my opinion of the book. The information was good, but I thought it poorly organized and in desperate need of an editor. I gave my copy back to my pastor because I knew I would never read it again. Well, we have a new pastor now, and he asked the elder board to read the book. I didn't have the same reaction to this edition as I did with the first. In a way, I wish I still had that earlier edition to see what changed. The star burst graphic is gone, thankfully. I didn't find the chapter that I thought should be split into two. I'm guessing the new publisher brought in an editor. I've always enjoyed serving on boards, work, symphony, church, school, HOA etc. The insights in his grey boxes throughout the book are important tools for your quote box and selection process for building teams anywhere. Buy it and keep it in your brief case.